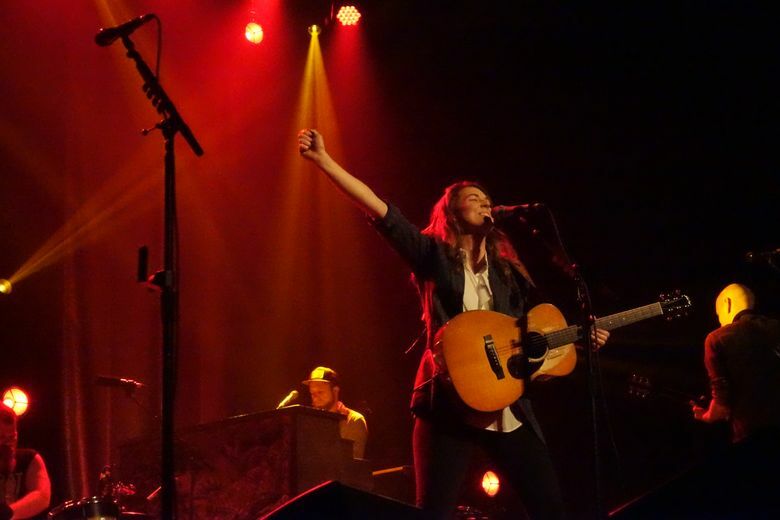 Washington's own Brandi Carlile, who is up for some of music's highest honors, led the way among local nominees, which also include Chris Cornell, Alice in Chains and Seattle Symphony. It was a big morning for the pride of Ravensdale, Washington. When the 2019 Grammy Award nominees were announced Friday morning, few expected to see Brandi Carlile’s name alongside hip-hop superstars like Drake and Kendrick Lamar. Yet Western Washington’s humble Americana star found herself — deservedly so — nominated for a whopping six awards, trailing only King Kendrick (eight) and the “God’s Plan” rapper (seven) who recently rocked the Tacoma Dome. What’s more impressive is that Carlile is up for music’s top honor in the three most prestigious categories: album of the year, record of the year and song of the year. Carlile’s hot hand immediately became one of the biggest story lines to unfold during the Grammy nomination announcements, which were postponed to avoid conflicting with the memorial service for President George H.W. Bush earlier this week. For a little perspective, Carlile’s six nominations are more than the five each received by red-hot stars Cardi B and Childish Gambino — two of the most talked-about artists of the year. Carlile’s arresting single “The Joke” — arguably the most vocally potent song of her career — will compete with Gambino’s “This is America” for record and song of the year. In the coveted best-album category, the singer-songwriter’s impressive sixth studio album, “By the Way, I Forgive You,” which tackles themes of forgiveness and new motherhood, is up against blockbusters from Post Malone, Drake, and Cardi B, the “Black Panther” soundtrack, critically lauded albums from Janelle Monae and Kacey Musgraves, and a surprise pick in H.E.R. This year the Recording Academy expanded the number of nominations in its four major categories — album, record and song of the year, plus best new artist — from five to eight. Elsewhere, Carlile’s “The Joke” is up for best American roots performance and best American roots song, while “By the Way, I Forgive You” faces off against albums from John Prine, Lee Ann Womack and others for best Americana album. In an interview with the The New York Times, Carlile said she knew while making the album that it was an emotional breakthrough for her, but never expected this level of commercial success. “I thought it might emotionally be a breakout for me,” she said. “I was reading a Joni Mitchell interview about the emotional state that she was in when she came to believe that it was time for her to write a record like ‘Blue,’ where it wasn’t observational, but personal revelations. I knew it was that for me, and it was the first time I wasn’t hiding behind phrasing and punch lines and jokes. While Carlile’s marquee nominations made one of the biggest splashes, she wasn’t the only Seattle-area artist recognized. The late Chris Cornell earned a best rock performance nomination with his haunting “When Bad Does Good,” the lead single off a new retrospective box set released last month. The video, starring Cornell’s son Christopher, takes viewers on a tour of Seattle landmarks through a Seattle Times paper route. The Soundgarden frontman’s grunge peers Alice in Chains scored a best rock album nomination for their “Rainier Fog” LP. The band celebrated its summer release with a full-on Seattle takeover, playing atop the Space Needle for a private crowd, popping up at a Mariners game and rocking a surprise show at the Crocodile, which counts drummer Sean Kinney as a part owner. The Seattle Symphony also came up big in this morning’s announcement, with its “Kernis: Violin Concerto” landing nominations for best classical instrumental solo (violinist James Ehnes) and best contemporary classical composition. Its Thomas Dausgaard-conducted “Nielsen: Symphony No. 3 and Symphony No. 4” is up for best orchestral performance. Dausgaard will serve as the orchestra’s next music director, beginning with the 2019-2020 season. Seattle Symphony’s three nominations were more than any other orchestra received. In other Seattle Grammy connections, “Quincy” — the Netflix documentary about Quincy Jones — earned a nom for best music film, while a Grateful Dead live box set of Northwest concerts is up for best boxed or special limited edition package. Dubbed “Pacific Northwest ’73-’74: The Complete Recordings,” the mammoth 19-disc set includes live recordings from the Seattle Center Coliseum and Hec Edmundson Pavilion. The winners will be announced during the 61st annual Grammy Awards show on Feb. 10 in Los Angeles.